You know, the Code is so powerful, so influential today in EVE that sometimes it's easy to take the Code for granted. What would EVE be like if there was no Code? The game would be a frozen wasteland of carebearism, if it even existed at all. Ah, one's first mining permit sale. Agents of the New Order, do you remember the first miner you sold a permit to? If not, then you've probably sold a lot of permits over a long period of time, so congrats. One Minus quietly increased his holdings of New Order stock by 100 additional shares this week, sending us over the 1,174 billion isk mark. One Minus earned a Supreme Protector's Tip of the Hat™. Agent Tengu Grib writes, "This comes courtesy of one of our friends who flies with Public Enemy." 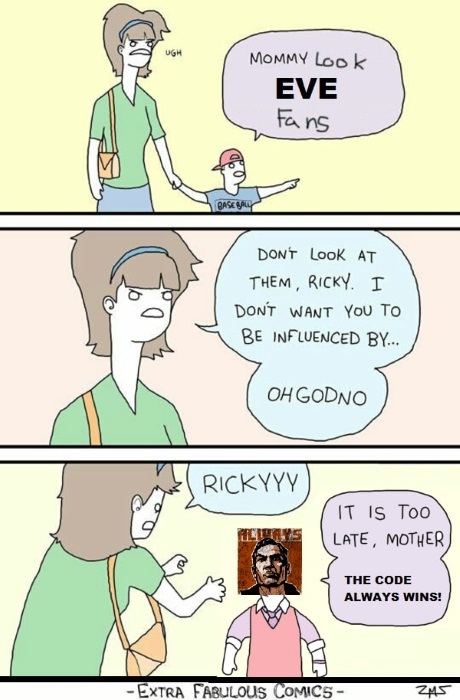 Speaking of the Code's influence! We all know the importance of parenting. But what often gets overlooked is the vital role that the Code plays in raising the next generation. A child raised in a stable home with two loving, attentive parents may yet grow up to become an unlicensed miner. But an orphan immersed in the Code will almost certainly become a ganker. Remember that Agent Wolf Soprano. Remember it. It is every player's civic duty to gank highsec carebears. Much like voting and jury duty, ganking is a thankless, yet very necessary for keeping EvE free from the ag scourge. Every null/low pilot should have at least one active highsec ganking character. 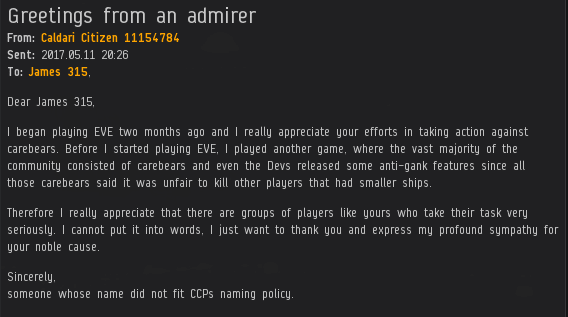 EVE provides a good living for low/null players, it's time we all gave back a bit. Do your part, kill some highsec carebears today! Help them and EVE prosper, kill them until they leave highsec.